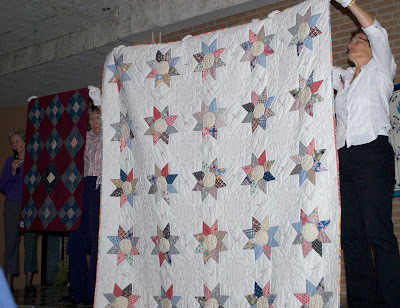 Between Stitches: happy national quilt day! 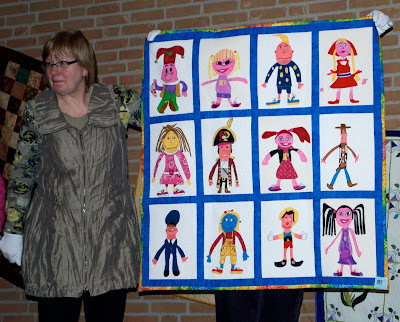 To celebrate the day I met up with my quilting friends in 's Gravenzande for "Tomatendag" or "Tomato Day" with Ted Storm ( with whom studied the art of hand quilting ). In this region many greenhouses are located where amongst many other kinds of produce and flowers, tomatoes are grown. Hence the name, simply put. It has been some time since I took her course, and the first time I came to this event. Why I didn't come before, I cannot for the life of me remember, but I'm happy I did this day! This is an annual happening where Ted's alumni can meet up again, catch up with each other, do a show and tell, and a little shopping. What's a quilting day without a little sniffle through some fat quarters? The shops certainly did not disappoint! Drawings from a son translated into wonderful appliqued blocks. An alphabet quilt - so charming! Made from Dutch folkloric costumes and fabrics - beautiful colors! 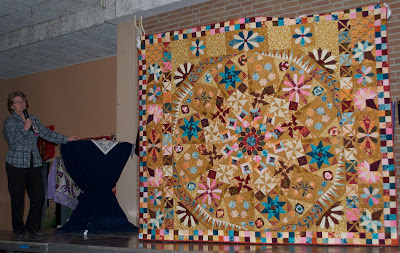 The applique is adorable, and the colors of the circles quilt are wonderful. 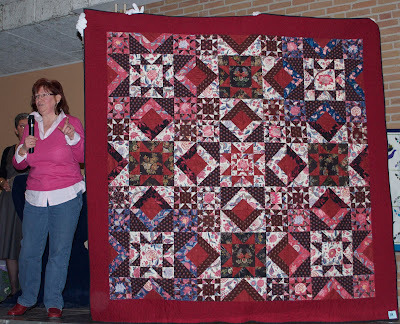 A massive block of the month quilt, wow! Souvenir quilt top and vintage block from a holiday in Amish country in Pennsylvania turned into classic quilts. Lovely quilts! Je zult wel een super leuke insprerende dag hebben gehad!